Ontarians are being connected to legal information and help through settlement workers, parks and recreation staff, counsellors, nurses, and librarians. What these people have in common is where and how they work: they are on the frontlines, providing help and services to people every day. For the first time, new research commissioned by The Law Foundation of Ontario examined the role of frontline workers, also called ‘trusted intermediaries’, across the province in providing legal information and help. ‘Trusted intermediaries’ are frontline workers at community organizations such as social service agencies, women’s shelters, settlement organizations, and community centres. Trusted intermediaries are not doing this alone. Legal professionals are helping trusted intermediaries and community organizations provide these supports to their clients. Ontario’s community legal clinics and other legal professionals have formed productive partnerships with community organizations. Lawyers, paralegals, and law students provide training, co-locate services, and develop referral networks. However, the research identified that more could be done to help trusted intermediaries connect with legal professionals to better serve the public. The greatest benefits to people with legal needs come when trusted intermediaries and legal professionals work in collaboration. And, the benefits of the collaboration were two-way, not solely for the community organizations. Legal professionals shared how the consistent involvement of a trusted intermediary helped them better understand a client’s full situation. By its nature, working collaboratively created a more holistic approach to serving the client. The legal professional could address the client’s legal need and also learn about resources that could help with any related issues, such as housing and health, that the client might also be dealing with. Another aspect of the community/legal relationship that the research explored was the ‘grey zone’. The grey zone is a term used to describe the area between providing legal information and providing legal advice. Of course legal advice can only be provided by a licensed legal professional; however when legal information tips over into advice can be unclear. 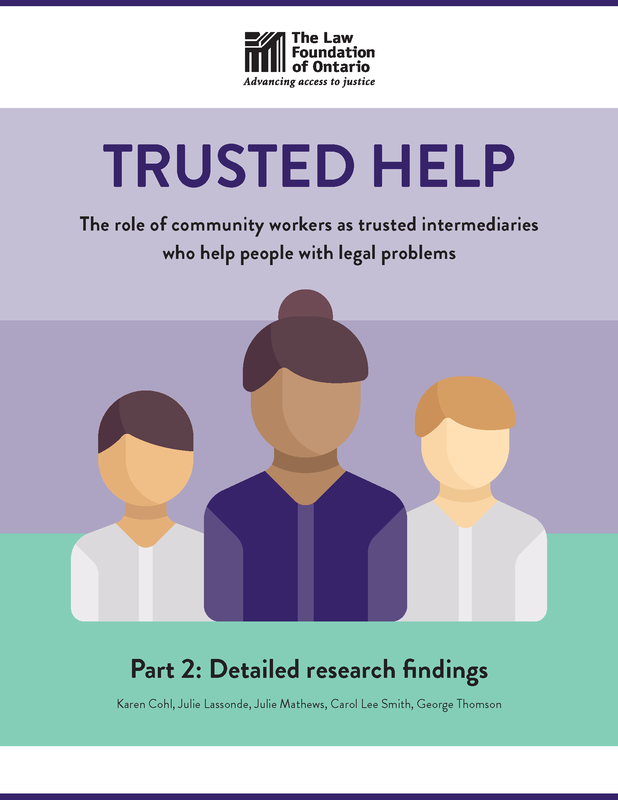 Overall, the research found that trusted intermediaries are well aware of the grey zone and that there sometimes can be a chill on the kinds of help trusted intermediaries provide because they are unclear about the boundary between information and advice. 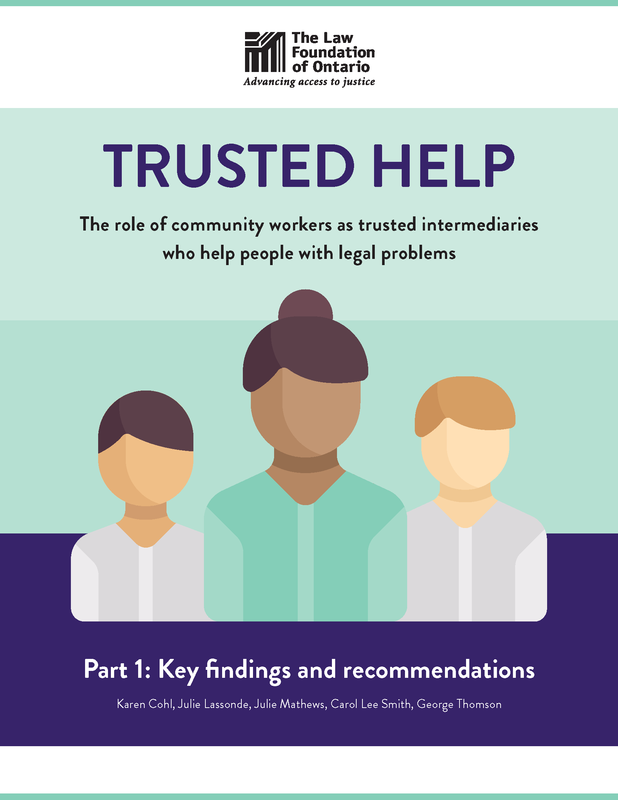 Trusted intermediaries are very motivated to help resolve their clients’ problems but they need more support to understand the types of help they can provide. Efforts to improve our understanding of the grey zone should include applied research to better understand what trusted intermediaries can do and should recognize that help from trusted intermediaries is, for some, the only help they will get with their legal problem. The research was commissioned by The Law Foundation of Ontario in order for the grantmaker to get a fuller picture of what trusted intermediaries are doing, what is working, and what could be done better. The Foundation is sharing the research’s learnings and recommendations with the legal, public, and community sectors, including its grantees, and the best practices learned will help guide the Foundation’s own grantmaking. The Foundation has understood and supported the unique and important role of trusted intermediaries for many years. This support is both direct, i.e. through direct funding of trusted intermediary-centred grants, and indirect, i.e. through granting where trusted intermediaries are connected to a funded organization or project. Since January 2015, the Foundation has funded 30 grants totaling almost $2M that focused exclusively on training and other supports for trusted intermediaries and funded an additional 82 grants totaling almost $13M that in part benefited trusted intermediaries. For example, the Foundation created Connecting Communities, a granting steam that is dedicated to training trusted intermediaries in legal issues. Thirty-eight Connecting Communities projects across Ontario have been funded. The full Trusted Help report can be found on this webpage. Trusted intermediaries provide people with legal information, make referrals to legal services, help clients fill out forms, and accompany people to meetings with legal service providers. Community workers can’t give legal advice, but they can and do help people better understand the law and navigate the legal system. “Frontline workers help when lawyers or paralegals become involved. They have a lot of information and understand the situation.